This two day trek across the river from Luang Prabang in the hills of Chomphet district is an ideal for people interested in exploring rural Luang Prabang. The trek offers a good variety of activities with its challenging climbs, green forests, views of Luang Prabang, agricultural fields, a cave, swimming and three ethnic groups: Hmong, Khamu and lowland Lao. Depart from Luang Prabang in the early morning, taking a 30-minute boat ride up the Mekong to Ban Moungkham in Chomphet District. 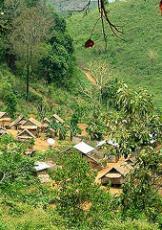 From there, walk 2 hours on a forested trail to Ban Houaypong, a Khamu Rok village. Take a short break in Ban Houaypong, before continuing 15 minutes to Houaypong stream, to eat a picnic lunch. After lunch, the trek begins an uphill climb to Ban Phuluang Tai. The trail is a steep climb for 2 hours, before reaching a ridge that is followed for 2 more hours, with sweeping views across the mountain ranges and valleys. Breakfast in Ban Phuluang Tai, then depart early. The trek down to Ban Som takes a little over 1.5 hours, following a steep downhill trail, passing Ban Mok Prai – another Hmong village. In Ban Som, an idyllic Lao Loum village surrounded by rice paddies, a creek, and mountains, tourists can rest and refresh themselves, before leaving their bags to hike to Tam Nang Anh (a cave 30 minutes uphill), then swim by a small waterfall at the base of the mountain. A village guide will accompany the tourists on the trek and provide information on the cave. Returning to Ban Som, the villagers will serve lunch, before making the final hike 3 hours back to Ban Moungkham on an easy road and trail. Return to Luang Prabang by boat, arriving in the early evening. Grade: Moderate to challenging with some steep climbs. Trekkers must be in good physical shape and be able to walk 5 hours per day.